New rules have taken effect in China that restrict car purchases in an effort to combat serious traffic problems in the capital, Beijing. City authorities will allow only 240,000 vehicles to be registered for 2011 - one-third of this year's total. Car buyers have been swamping dealers in anticipation of the new rules, which will still leave about five million cars on the road in the capital. Traffic and air pollution in Beijing is among the worst in the world. Beijing officials are trying to balance the desire of a growing middle class to have the convenience and status of car ownership, with a huge congestion problem. Officials said the new rules would not solve the full extent of the city's problems, only slow the down the rate at which they are worsening. "It will be difficult to dramatically improve the traffic situation in a short time," said Liu Xiaoming, deputy director of the Beijing Traffic Management Bureau. "But it can slow down the pace of worsening traffic congestion." Car registrations will be allocated by a license plate lottery system from Friday. Under the new rules, government departments will not be allowed to increase the size of their fleets for five years. About 750,000 new cars appeared on Beijing's streets this year, raising the total of registered vehicles for the city 4.8m. China overtook the US as the world's biggest car and van market in 2009, with 13.6 million vehicles sold within the country. Nearly 90% of the new licence plates will be allocated for residents; people driving cars into Beijing from other areas will need permits to do so. The authorities have delayed the imposition of a congestion charge - a fee for cars to enter specified zones - saying the idea needed more study. In anticipation of the new ruling, 30,000 new vehicles were registered in the past week, at least three times the normal rate, Xinhua state news agency reported. "I heard that they were going to change the policy, so I wanted to buy this [car] before the year was over," one buyer, Mr Yang, told the BBC. "We rushed to buy a car, because I need it for work. But it will be really inconvenient for me to drive a car when the streets become so congested," he said. There remains a high level of scepticism about how well the new measures will work however. Yang Ailun of Greenpeace China told the BBC that the restrictions had come far too late. "We definitely welcome any kind of policies that try to reduce air pollution and control cars. However, the problem is that it comes too late. "Everything in China now happens so quickly, and the government always fails to anticipate what's coming, and as a result normally policies are only introduced when things are already out of control." 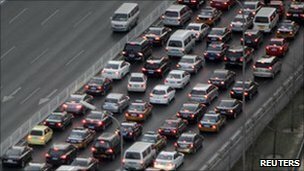 Residents say that Beijing's roads sometimes resemble car parks. A record 140 traffic jams were recorded on one evening in September. A spectacular 120km (75-mile) long traffic jam formed on the Beijing to Tibet route in early September, only a week after another 100km (62-mile) jam had been cleared in the same area.